BIODIVERSIVIST: Is it wise to exclude nuclear from the mix? "Is it wise to exclude nuclear from the mix?" yes, US NPP's can easily be replaced by hydropower coupled with wind and geothermal, if I believe underneath copied clippings, and the alternatives will also be much cheaper than new 15 cents per kWh NPP power plants now being built in the USA . . .
March 25, 2011 - The solution to the variability of solar power is more solar. The aggregate production of just five dispersed solar power plants drops the utility’s backup costs by 75%, and putting twenty-five solar power plants across a broad region reduces those costs by 93%, to far less than a penny per kilowatt-hour (kWh). Solar power isn’t the silver bullet, but its variability is an argument for, not against, its expansion. Comment 20 Bob_Wallace : Marvin, we've got something like 80 000 existing dams in the US. We use about 2500 for power generation. Extrapolating from a 2007 study of existing dams on federal lands, several thousand of these dams should be fine for power generation. They have adequate head and inflow. They are reasonable close to existing transmission lines. Some of these dams are already being converted to power producers. Additionally there should be thousands more dams which would work fine for pump-up storage purposes. They meet the head and distance to transmission criteria but lack the stream inflow to be used as primary generators (http://www.usbr.gov/power/data/1834/Sec1834_EPA.pdf). Additionally we have many gigawatts of potential from run of the river hydro (http://www.nirs.org/alternatives/factoid17.htm). Don't make the mistake that the few environmentalists who try to protect every single square foot of the Earth from use are representative of the majority of environmentalists. Most of us realize that if we don't accept some of the Earth being used for wind farms, energy storage, etc. we will end up screwing all the Earth. 31 March 2011 - Spain's central government objective for renewables to cover 40% of total electricity supply by 2020 is achieved in 2010. Red Electrica reported that in the first quarter of 2011, the renewable technologies covered 40.5 percent of the demand, a little less than in the same period in 2010 when it reached 44 percent. In March 2011, 57.9% of Spain’s electricity was generated by technologies which do not emit CO2, and wind power energy was the technology with the largest production of electricity. Spain generated nearly 3 percent or 6.7 TWh of its electricity from solar energy, wind turbines generated 21 percent or 55 TWh, and hydroelectricity's share was 17 percent or 44 TWh. The new renewables of wind and solar in combination provided nearly 24 percent of supply. Together both new and conventional renewables delivered 40.5 percent of Spain's electricity. Cogeneration (15 percent), natural gas CCGT (17 percent), coal (13 percent) and nuclear (19 percent) provided most of the rest. Spain's climate, geography, and population are similar to that of California. Spain's 46 million inhabitants consume some 260 TWh per year. California's 37 million people consume about 300 TWh per year. However, wind energy generates less than 6 TWh per year and solar less than 1 TWh per year in California. Together wind and solar provide only 2 percent of California's electricity. 8 april 2011 - Cost, Not Japan Crisis, Should Scrub Nuclear Power. Americans should abandon nuclear power for its prohibitive and un-competitive costs. The wildly escalting costs of nuclear plants under construction in the U.S. are a perfect example. This figure is reinforced by an estimate for Progress Energy's two new units (est. $6300 per kW now $8800 per kW), and Georgia Power's new plants (est. $4000 per kW now $6335 per kW), both still incomplete. What do those costs mean to consumers? At $6500 per kW, Cooper estimates a midpoint cost of nuclear electricity of over 15 cents per kWh ($150 per MWh). At that price, investment bank Lazard estimates that only two technologies are more expensive than nuclear (crystalline silicon solar PV and natural gas peaking plants). In the time it would take to build a nuclear plant (6-8 years, optimistically), every commercial energy technology could produce electricity for less. Subsidies can change the picture – the picture most Americans have of nuclear, that is. The Union of Concerned Scientists recently reported that nuclear subsidies total nearly 7 cents per kWh, twice what a typical wind power plant receives and similar to the federal incentives offered for solar power. We shouldn't eschew nuclear power for its ability to cause immensely disproportionate harm during natural disasters. Instead, we should abandon this costly boondoggle for more cost-effective and renewable energy sources. 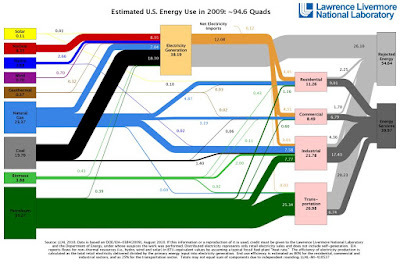 You have mistaken an argument to use nuclear power along with other low carbon sources of energy as an argument against other low carbon sources of energy. Just because sunny Spain can put solar to good use does not mean that everyone can. Where I live we are literally giving away hydro power because we temporarily have more than we can use. But, hydro power is not the answer in Spain just as solar isn't the answer in Seattle. I just realized after following your links that very few of the words in the comments are actually yours (you did not spend the time and effort to think them up and type them in as would be appropriate). You have been cutting and pasting from the articles you provide links to. You are free to comment, using your own words that you type. You are encouraged to back up your thoughts with links to validate the information in them. You may of course also include short quotations (in quotation marks) from sources. You may not simply copy and paste other authors' work into the comment field. I will leave this comment up but future comments containing excessive and unquoted copied text will be deleted. The articles you copy from have comment fields under them and I encourage readers to follow those links and read the critiques of them in those comment fields. I have no quarrel with your arguments about nuclear, and think Monbiot is spot on. I would like to see a ling term answer tio the waste storage though. The most surprising thing about that excellent chart, IMO, is that biomass is a larger energy contributor than wind, solar AND hydro combined! I am a fan of biomass as an energy source (not THE energy source) as it is something that can be produced almost anywhere, by almost anyone. Also, like hydro, it is a storable renewable energy and so has some value there. As for transportation, the only way is to reduce the size of that beast, not find different ways to feed it. I suspect that you are talking about wood stoves for heating?